What’s new with your updated cookbooks? 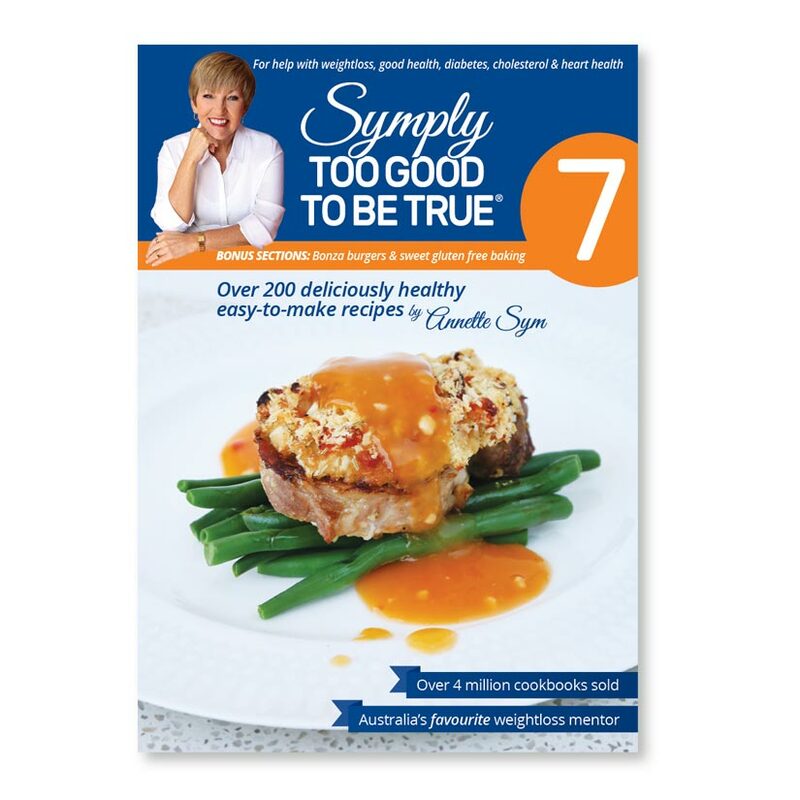 I am so proud to reveal to you my new look, tried and tested, family favourite cookbooks. When I was updating all seven cookbooks I looked at every recipe as if I was writing it for the first time in 2017. There was nothing wrong with the original but if I could make it better, why not. I have learnt so much over the last 19 years about creating recipes and I’ve also learned a lot about photographing food. Back in 1997, just having a photo of every recipe was huge. Having a nutritional panel was also rare and now there are nine different components listed in my panels which gives you an accurate understanding of what’s included in every tasty mouthful. 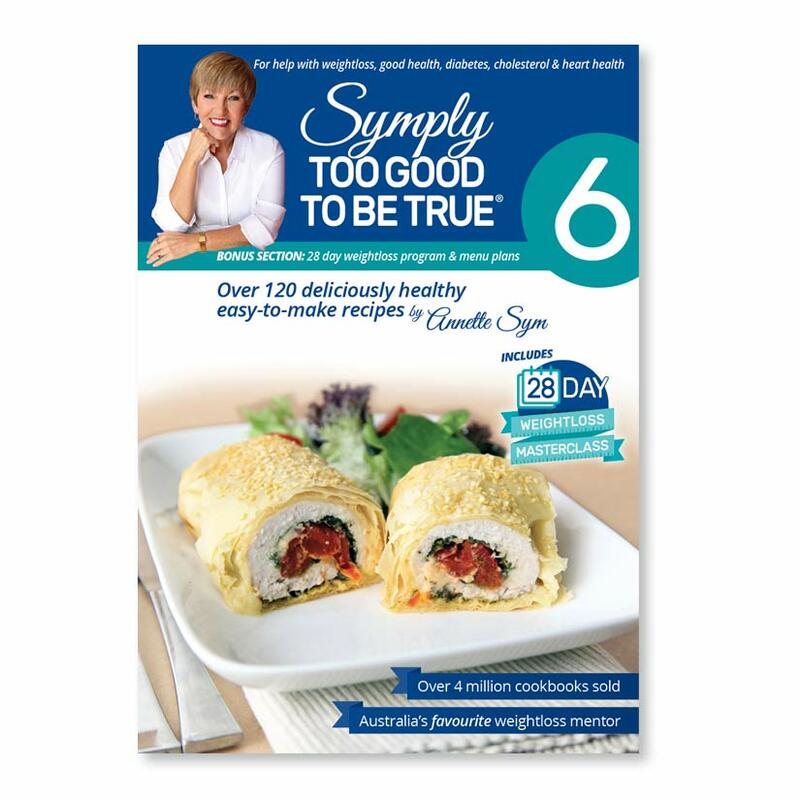 It’s my wish that these recipes will serve the next generation to help them to make healthier choices and learn that healthy and delicious can go hand in hand when you cook the ‘Symply Too Good To Be True’ way. What’s new with my updated cookbooks? • Updated 28 day Weight Loss Masterclass in book 6, now with online component. I have all of your cookbooks which are fantastic! Will there be a list of Substitutes for the discontinued products available on line and also for the changes in recipes? Thanks for your reply. Good luck with the new books! I also have all your cookbooks and the recipes are great. 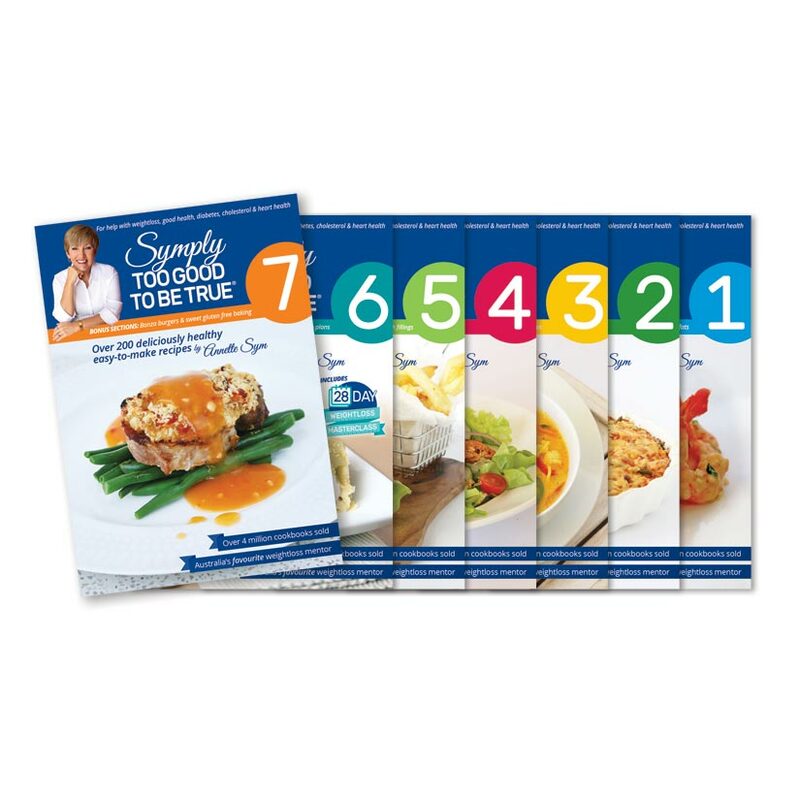 Will the new books also advise which recipes are suitable for the slow cooker? Always loved your recipes. Our favourite ones the nutties which i have mastered lol and macaroni beef. The page just falls open in that book, cooking stains and all. 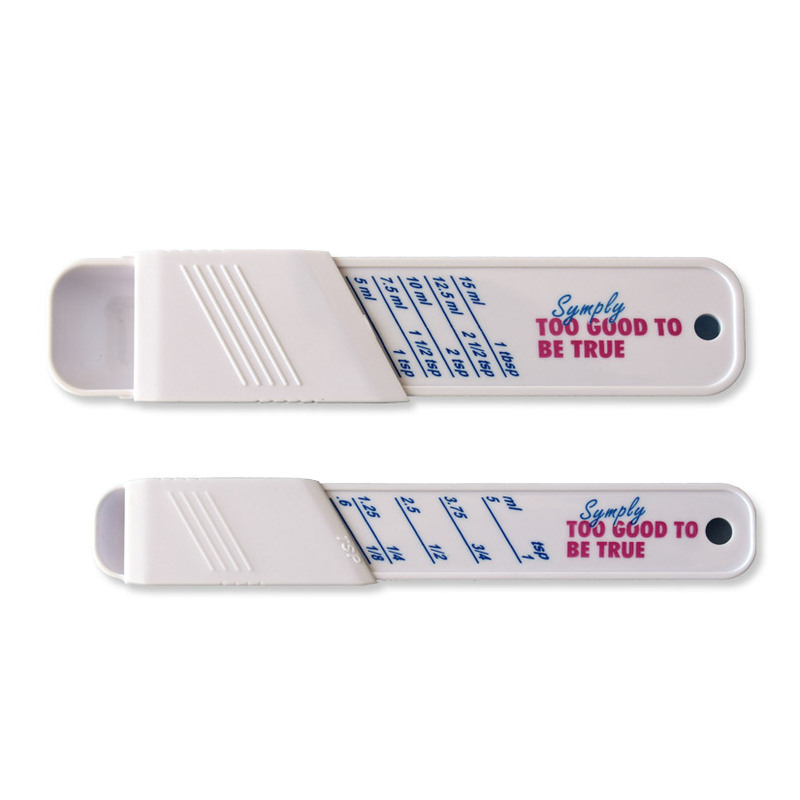 Many years ago I lost confidence in my cooking, I had been unwell and it was an effort to stand up to prepare meal. The recipes were easy and tasted good made a huge difference . Thanks for the books, looking forward to looking at the new ones. Whilst I’m more than happy with my existing full collection, I applaud the changes the new books will have – coloured-coded spines & numbers easily spotted on the spine are just two “symple” but oh so useful changes. Thanks Annette & team. Will the new set of cook books show with each recipe a sign for suitable for freezing. Look forward to the 14 March. Thanks Jenni, glad you love them. Congratulations on the new and improved cookbooks. They look amazing and I look forward to updating my splattered and well loved books (even scribbled on by my toddler at the time who has just started Uni! – she also can whip up any of your recipes). I have so many favourites in all your books and I thank you so much for many delicious years of quick and healthy eating. Thank you for your lovely words of encouragement. I am very excited to have my books updated and to bring them into 2017. Book 1 is 19 years old so they did need a bit of a makeover 🙂 Same fabulous recipes but looking so fabulous. I love that your daughter uses my recipes too, that’s awesome 🙂 I appreciate your support. Thank you so much for your kind words. I am so happy that you are enjoying my recipes and I can’t wait for you to see the new updated 2017 versions, they look AMAZING!! I love all of your cookbooks have used them lots. Recipes very easy to follow and prepare eating healthy tasty meals every day. I also can’t wait for the new books. Thank you for bringing us your beautiful much loved recipe books. Thank you for your kind words. I am so pleased that you have been enjoying my recipes. I can’t wait for you to see the new updated 2017 versions, they look amazing and it fills me up to see my recipes look so modern and fresh (book 1 is 19 years old). I appreciate you popping by and saying hello. Congrats on the new and improved books and website not that your books needed updating as they are still fabulous. I still have 5 of the original and use them often. I am getting back in shape for my upcoming tv show and your recipes are always delicious so getting into shape is very easy. 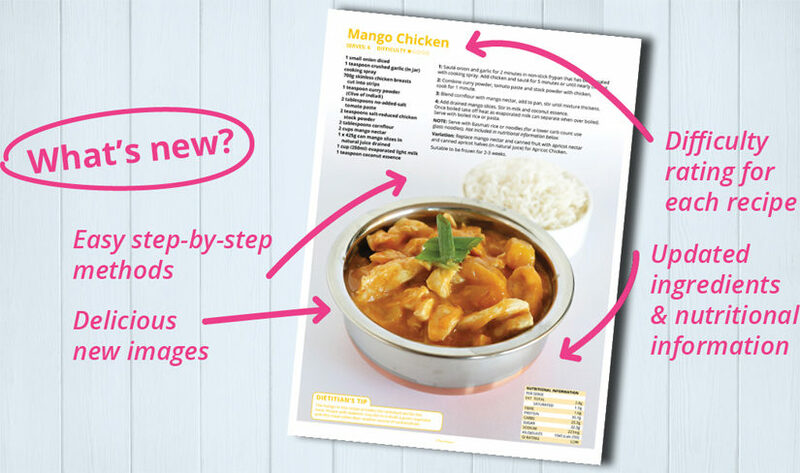 New the new cookbooks look fantastic. I have the full set and use them regularly. 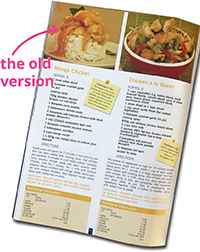 Can you advise is there much variance from the old to the new nutritional panel information. I use this all the time and find it extremely useful. Love all your cookbooks & when I moved to Qatar 3 yrs ago for work I couldn’t bring the whole set as my 19 yr old (at the time) son wanted to be able to use them! Each time I go home I change books & have introduced your cookbooks & website to my colleauges here. I have had to substitute some ingredients due to unavailability in Qatar but find they still work really well. Now my daughter has started uni away from home so there’s competition between my children for the books. How lovely to hear from you and you made me smile when you talked about how you share your cookbooks with your children. That’s awesome, you have taught them to think healthy so what a great mum you are. Qatar, I’ve never been, would love to one day. Maybe we should talk about organising me to come over and do a workshop? Keep enjoying my recipes and thanks for your kind words. I previously had Books 1 to 5 but had barely used them. Recently I bought book 6 and 7 and now cook from them every day. Love them so much I am buying myself a complete new set and giving the others 2 my daughter who is looking for new healthy recipes. I have sticky notes everywhere on the pages I want to try, and all 7 books have come with us on our 3 week caravan holiday on the East Coast. Oh and I have lost 5kg in 3 weeks. So easy. No more diets …..EVER!!! I have all your now (old) cookbooks and use them regularly. I am debating about buying the new books. Congratulations on all the work you have put into bringing these recipes to us. Thanks. I have 3 of your set of books. local Newsagency will not be stocking them any more, So I need volumes 2,5,6 and 7. Thank you I will add 6 and 7 to my cart. T%hen I will just need volumes2 and 5. Thank you so much Debbie. Where can I find all the things that need to change ingredients that Woolworths or coles don’t sell anymore. Having trouble looking for something to match it. Help please.